Milton’s Selected Poetry and Prose presents the major poetic (excluding Paradise Lost) and prose works along with supporting materials necessary for in-depth study. 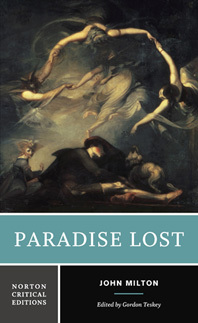 Together, the Norton Critical Editions of Paradise Lost (ed. Gordon Teskey, 2005) and Milton’s Selected Poetry and Prose are the essential texts for studying John Milton. This Norton Critical Edition is designed to make Paradise Lost accessible for student readers, providing invaluable contextual and biographical information and the tools students need to think critically about this landmark epic. Gordon Teskey's freshly edited text of Milton's masterpiece is accompanied by a new introduction and substantial explanatory annotations. Spelling and punctuation have been modernized, the latter, importantly, within the limits imposed by Milton’s syntax. "Sources and Backgrounds" collects relevant passages from the Bible and Milton’s prose writings, including selections from The Reason of Church Government and the full text of Areopagitica. "Criticism" brings together classic interpretations by Andrew Marvell, John Dryden, Victor Hugo, and T. S. Eliot, among others, and the most important recent criticism and scholarship surrounding the epic, including essays by Northrop Frye, Barbara Lewalski, Christopher Ricks, and Helen Vendler. A Glossary and Selected Bibliography are also included.